Palmusic UK, in collaboration with Sarum Concern for Israel/Palestine and Brighton and Hove Palestine Solidarity Campaign, is proud to present two special concerts in February 2018 showcasing our students’ talent and music. These concerts are in support of our UK Scholarship Fund that enables young talented Palestinians to study at UK Music Conservatoires. Omar and Tibah Saad are two of our current students who have been awarded Palmusic UK Scholarships and they are now studying at the Royal Conservatoire of Scotland. Thanks to the generous help of our supporters, we covered the first year of their studies, however within the next few months, we will need to raise another £10,000/each to ensure that they can continue their degrees next year. The concerts will present a wonderful music programme prepared by our young musicians and will help them raise the remaining funds they need for the completion of their studies in the UK. 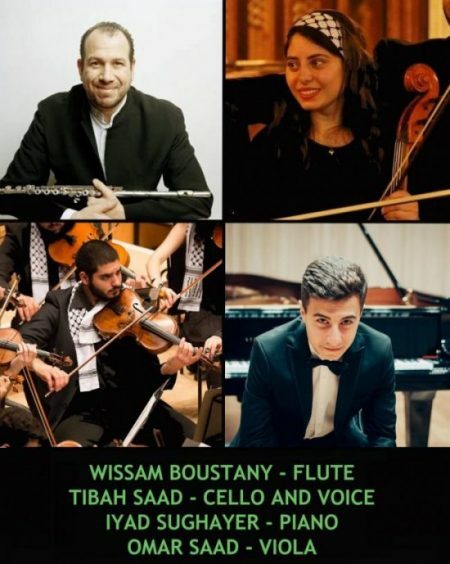 Tibah and Omar will be joined by Iyad Sughayer, one of the most promising Jordanian-Palestinian young pianists, who has recently won the prestigious 2018 Trinity Laban Gold Medal Award, and by Wissam Boustany, internationally renowned Lebanese-Palestinian flutist and Trustee of Palmusic UK. The programme features an exciting combination of Classical Western and Middle Eastern music, including famous pieces by Johann Sebastian Bach, Ludwig van Beethoven, Robert Schumann, Franz Liszt, Antonín Dvořák, Aram Khachaturian, Edwin York Bowen as well as Jordanian-Palestinian contemporary composer Tarek Younis. If you cannot attend one of these concerts, you can still support Omar and Tibah by donating through our website, by cheque (Palmusic UK, 1 Gough Square, EC4A 3DE, London) or through their GoFundMe Campaign. The Palmusic UK Scholarship Fund also supports the young violinist Lourdina Baboun from Bethlehem, who is currently studying at the Royal Birmingham Conservatoire. For more information, please visit our news page.